A near-term spending bill proposed this week by the Trump administration would eliminate funding for a federal grant program that supports the recovery of declining Pacific salmon populations. And this could leave states scrambling to fund conservation and research projects they'd already planned for the rest of this year. The proposal is part of a stopgap budget plan from the White House for the rest of fiscal year 2017, requesting $33 billion in additional funding for defense and a border wall, while also calling for $18 billion in cuts to other federal programs. It's a separate plan from the 2018 budget proposal revealed earlier this month. The Pacific Coastal Salmon Recovery Fund is one of the programs on the chopping block. It's a federal grant program, managed by the National Oceanic and Atmospheric Administration, that provides funding for Pacific salmon and steelhead trout recovery efforts in Alaska, Washington, Oregon, California and Idaho. The program's long-term future may also be uncertain. An outline of the Trump administration's proposed budget for fiscal year 2018 calls for $250 million in cuts to NOAA grants and contracts, which may include funding for the salmon conservation effort. The program was established in 2000 in response to significant fish population declines in the Pacific coastal states, in large part because of human-induced habitat changes such as dam building and other development. NOAA currently lists 28 individual salmon and steelhead populations as threatened or endangered under the Endangered Species Act. Salmon fill an important ecological niche along the Pacific Coast, serving as a key food source for certain endangered orca populations, such as the Southern Resident population, which spends several months each year in Washington's Puget Sound. 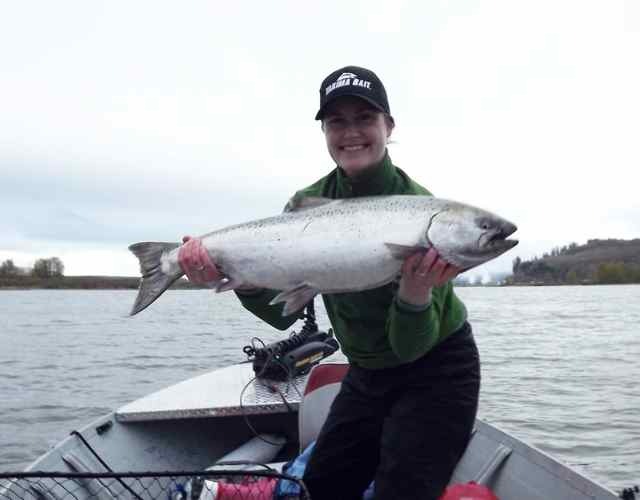 They also have great cultural importance to Native American groups, "many of whom have treaty-based fishing rights," according to Kaleen Cottingham, director of the Washington State Recreation and Conservation Office, which manages the state's salmon recovery efforts. Much of the Pacific salmon that's sold in supermarkets today was farm-raised or originated in a hatchery before being released into the wild. Restoring wild populations could eventually allow commercial fisheries to safely harvest more fish. This could also reduce the need for salmon hatcheries, which some experts say may actually contribute to wild population declines by producing fish that compete with wild salmon for resources. The recovery fund was allocated $65 million for fiscal year 2017, and the money goes to recovery efforts managed by state governments and federally recognized Native American tribes. Projects eligible to receive funding can include water restoration efforts, population monitoring, research aimed at better understanding the causes of fish declines, or efforts to improve the sustainability of hatcheries. But the new budget plan would zero out its funding for the rest of the year. While $65 million spread across five states may not sound like much, especially compared to $18 billion in total proposed budget cuts, the money goes a long way, Cottingham said. The program leverages significant extra cash in the way of matching funds from state governments and private sources. Washington, the state that receives the greatest amount of funding under the program, is required to bring in a 33 percent match in funding, Cottingham said. The program has awarded a total of $1.2 billion to states and tribes since 2000 and leveraged an additional $1.4 billion in matching funds, according to NOAA. That's good for recovery efforts and also helps state economies. NOAA found that each $1 million investment from the salmon recovery fund leads to 17 new jobs and $1.86 million in added economic activity. There are other benefits. Cottingham said efforts to improve river flow and other landscaping projects can help reduce the risk of flooding. Eliminating the program -- even if only for the rest of this fiscal year -- could cost jobs, hurt the economy and disrupt or delay numerous projects that had already been planned for the coming months. "We would probably do less than half of the projects that we're taking applications for right now for on-the-ground projects," Cottingham said of Washington state. The stopgap budget plan suggests that, after the salmon recovery fund has been eliminated, funding for these projects be coordinated with another NOAA species recovery program. But this program already tends to receive far less in funding than the salmon recovery fund. The agency noted that its allocation for 2017 would be no more than $16 million, and that new awards would likely range up to about $300,000 each. Extended cuts to the salmon conservation effort would almost certainly be challenged by litigation from states, tribes and environmental groups, Cottingham said, potentially with support from Democrats and Republicans. "At least in the state of Washington, this is a bipartisan congressional approach," she said. "We get support from our delegation, regardless of party, and we hope to continue that into the future." Chelsea Harvey is a freelance journalist covering science. She specializes in environmental health and policy.